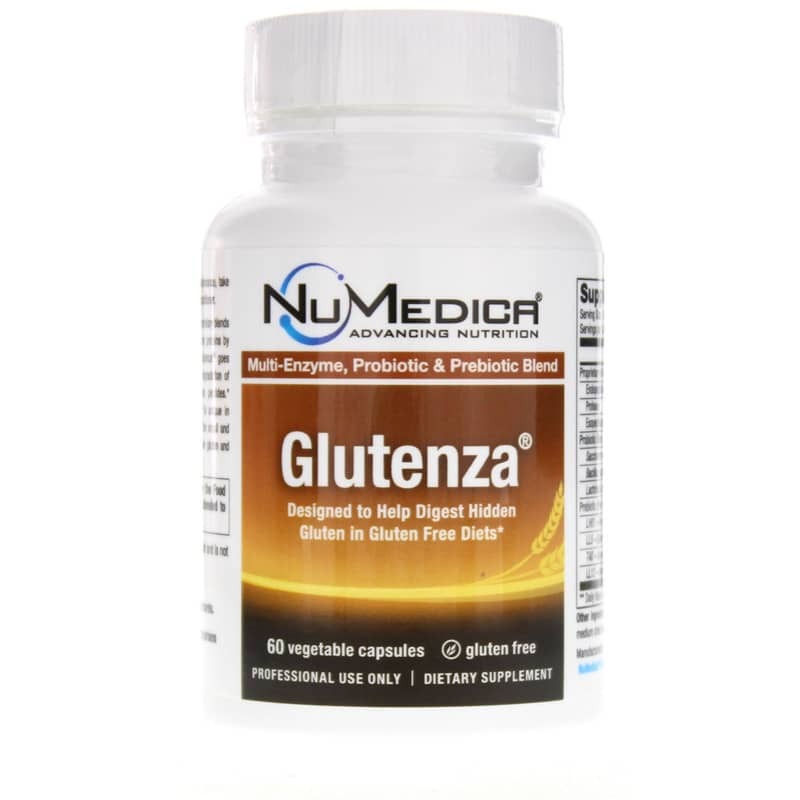 Glutenza from NuMedica is a dietary supplement featuring a multi-enzyme, probiotic and prebiotic blend designed to help digest hidden gluten in gluten-free diets. If you're following a gluten-free diet, you know just how challenging it can be. As much as you might scrutinize the ingredients list of the foods you purchase, you may still run into gluten in places you wouldn't expect. To keep uninvited gluten from ruining your day, be ready with Glutenza. With a blend of enzymes, probiotics and prebiotics, Glutenza can help your body deal with the effects of ingesting small amounts of gluten. 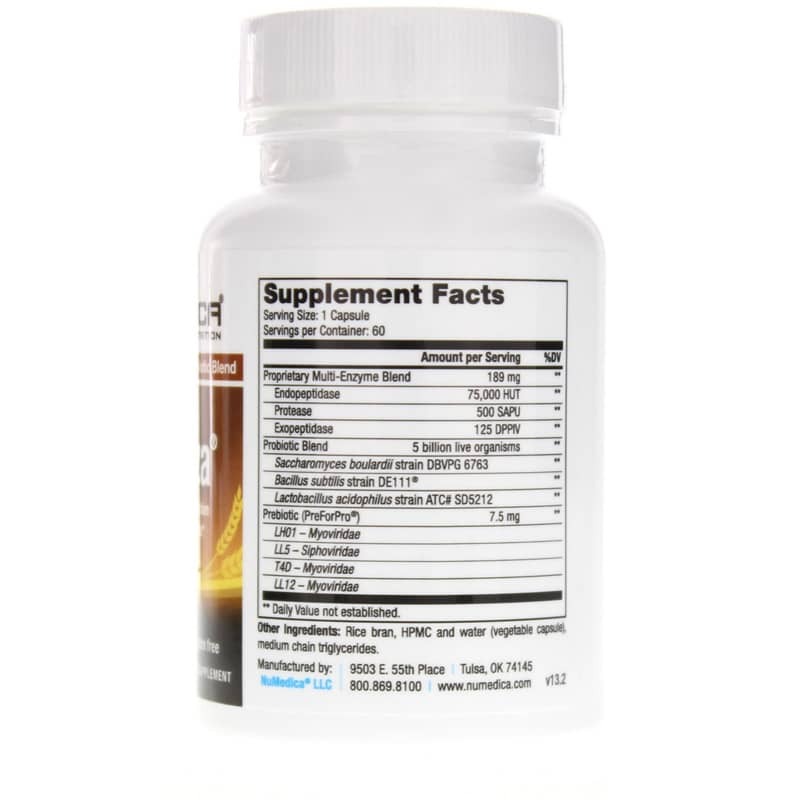 Targeting both internal and external peptide bonds, this formula helps to break down gluten proteins. Glutenza even goes beyond the traditional DPPIV enzyme, breaking down unhydrolyzed gluten peptides for optimal gluten protein degradation. For additional support, the specialized prebiotic PreForPro helps to feed and maintain beneficial bacteria in both the small and large intestines. These bacteria are essential for optimal breakdown of gluten and other proteins. 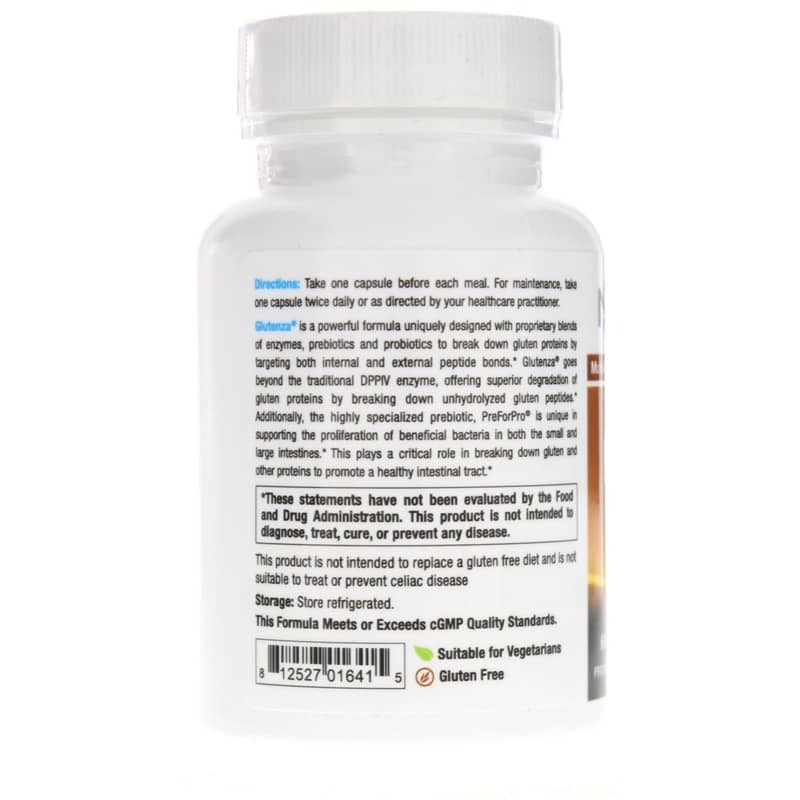 One capsule contains a proprietary multi-enzyme blend, a specialized prebiotic blend and 5 billion live organisms from three strains of probiotic bacteria. Get comprehensive support for handling the gluten in your life. Order Glutenza today. Contains NO: gluten. Suitable for vegetarians. Adults: Take one capsule during any meal suspected of containing gluten. For maintenance, take two capsules daily or as directed by your healthcare practitioner. Natural Healthy concepts delivered the product very fast. I've been using Glutenza for several years.<br>It has helped me to be able to tolerate foods that have hidden gluten. <br>I can leave a more normal life with the help of Glutenza. Natural Healthy Concepts are an efficient provider of this product. This is the second bottle of Glutenza I've bought. I really recommend it if you prefer to a eat gluten free diet. I don't have an allergy but prefer not to eat gluten. Sometimes though when on vacation or going out for dinner, there aren't many choices. If I take my Glutenza right before I eat I don't get the bloating and gas I usually get. On a recent trip to Mexico, I was able to eat wherever I wanted too. I would recommend it to anyone who prefers to eat a gluten free diet.